Recently I read a book about ADD called Attention Deficit Disorder : A Different Perception, by Thom Hartmann. This book was recommended to me as a way to self diagnose whether I have ADD, in particular by looking at the criteria he discusses starting on pg. 15. (The Hallowell-Ratey criteria) If I give each bullet point of the criteria equal weight it doesn’t diagnose me with ADD, but alternatively the different points could be weighted unequally. 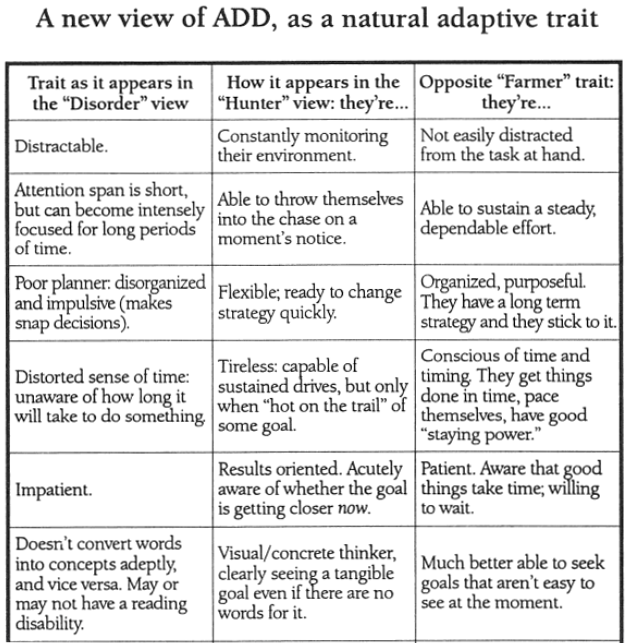 In principle ADD/ADHD exists may exist on a spectrum, as well. As a side note, many psychiatrists and researchers differentiate between ADHD and ADD, which has no hyperactivity, the technical name for which is now ADHD-Predominantly Inattentive (this name doesn’t seem to be catching on). Overall I cannot recommend this book, because the author doesn’t rigorously back up most of his assertions. The book also seems to be somewhat cobbled together, and it appears that about 2/3 of the way through he ran out of new material and decided to ‘fill it out’ by rehashing and attaching anecdotes. He also attaches a bizarre hippy-esque rant to the end of his book, lamenting how are current culture is ‘destroying the Earth’, which uses the mostly discredited ideas of the noble savage and a neo-Luddite ‘return to nature’. To my dismay, the book also mentions homoeopathic remedies as a ‘possible avenue’ for treatment of ADD. Later I found out that Hartmann has three degrees in herbology and homoeopathic remedies. However, there were some thought-provoking conjectures that Hartmann makes which I will recount here. I want to emphasize it is not at all clear whether these conjectures are true, as (like many things with ADD), not many scientific studies have been done to test them. The hunter vs. farmer hypothesis is the main point of the book. The idea is that we should think of people with ADD not as damaged or ‘ill’, but as a different type of person endowed with a mental structure / biochemistry which gives them unique mental talents. Hartmann proposes a simply analogy – people with ADD are better hunters, while people without are better farmers. Many of the symptoms of ADD are advantageous to hunters, for instance being easily distracted and constantly scanning of the environment. From this point of view, a short attention span means “being willing to throw oneself into the chase at a moment’s notice” and acting without considering consequences (impulsiveness) is seen as “being able to take risks and face danger”. Hartmann also claims people with ADD are less adept with language but more adept at spatial thinking (there doesn’t appear to be any hard evidence on this though). Many cases of ADD are associated with specific genes, so Hartmann proposes that these genes were maintained for millennia since they were evolutionarily useful. Hartmann claims people with ADD are “hunters living in a farmer’s world”. The idea that there may be an evolutionary advantage to having ADD people in the gene pool is not exactly new and has been applied to other mental disorders which are known to be strongly genetic. In particular schizophrenia is a highly debilitating disorder, yet it persists over long stretches of time at a fairly high occurrence (roughly 1% of the population). There are many conjectures as to why this is. The “hunter vs. farmer” hypothesis is very interesting. At the very least, the ‘hunter’ narrative is better than the ‘illness’ narrative (which in itself can be very damaging to children). Incidentally, Hartmann sees great usefulness in drugs for helping children with ADD do better in school, but he also thinks different forms of schooling for ADD/ADHD children need to be explored. The general impression I was left with is that in the US ADD drugs may be over-prescribed to children but under-prescribed to adults. Although Westerners have recently imported a lot meditation practices from the East, forms of meditation have been used in the west for centuries. In particular, Hartmann highlights the Catholic “rosary meditations” and other forms of Christian meditation. According to Hartmannl, there is a continuum of states of consciousness, with ‘open’ consciousness on one end of the spectrum and ‘focused’ on the other end. This makes a lot of sense, and is very similar to dichotomy between ‘convergent’ and ‘divergent‘ form of thinking. Hartmann proposes that the ‘baseline’ state of consciousness varies a great deal between people. Different forms of meditation emphasize moving one’s consciousness towards either end of the spectrum, so people who are more ‘open’ will find ‘focusing’ meditation useful, and vice versa. Hartmann points out that in the East both forms of meditation developed and flourished, while in the West, only the focused form developed (Christian forms of meditation are always ‘focused’ on a particular concept or a particular verse of scripture). Hartmann hypothesizes that ADD will be less prevalent in places like Japan, but recognizes there not yet any research that compares the incidence of ADD in different geographical regions of the world which can support his hypothesises one way or the other. (the panoply of different criteria for ADD is not a major obstacle to such studies, as long as one takes a widely-used criteria and applies it consistently around the world). As with many disorders, most studies have focused on people in the US and other developed countries. It will be interesting to see if the incidence of ADD is lower in China and Japan, which have both been historically very agriculturally oriented. Zen meditation (which originated in China and became popular in Japan) often emphasizes focus but the ultimate goal of Zen is an ‘open’ state of consciousness. I am not at all an expert on meditation, but from what I have seen the ‘focusing’ meditation techniques which are now popular in the West as a way to build (or rebuild) focus (ie breathing meditations and mantras) appear to be more endemic to Hinduism, which has historically been absent from a lot of China and Japan.